My heart leapt into my throat as I caught my first glimpse of the ship. The following is part of a multi-part series to run over the next few months. Melissa Baffa, Vice President of Program and Volunteer Services for GSCCC, will be joining the Corps of Exploration this year on the adventure of a lifetime. This blog series will chronicle her dive into the Unknown. My heart leapt into my throat as I caught my first glimpse of the ship. I had studied her in numerous photographs, so already she felt like an old friend. 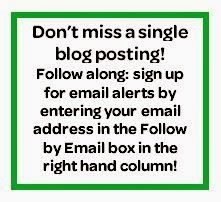 But my thoughts raced – home! For the next three weeks! There she was – the Nautilus! The E/V Nautilus in Panama. The air was hot and humid. 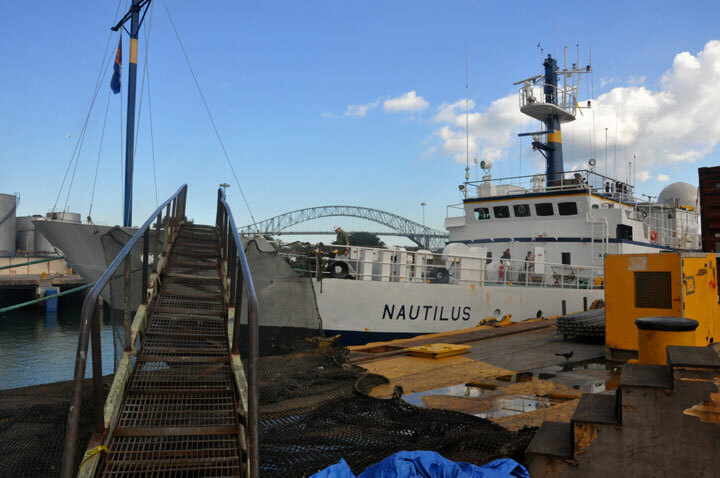 An immigrations official escorted us through the shipyard to where Nautiluswas docked. Of course, I had my camera slung about my neck to capture the moment. I was joined by Ethan, veteran crewmember that I had met in the hotel lobby and had ridden to the shipyard with. He looked back and caught my huge smile. “Wow!” was all I could manage. Boarding the ship up a rickety gangway (rigged because the ship’s shorter gangways could not accommodate the big tidal swings), I felt the weight of my bags keenly. Three weeks’ worth of stuff packed into two bags, and I was aware of every pound. I held my breath as I stepped onto her deck for the first time, marking the moment in my memory. I was greeted and given a tour by the two offsigning Science Communication Fellows, Tammy and Beverly. They showed me my cabin, the bathrooms, the laundry room, wet lab, data lab, studio and gym. Giggling, I greeted Hercules (the ROV) in his hangar. “Nice to meet you,” I exclaimed, pretending to shake his robotic hand. 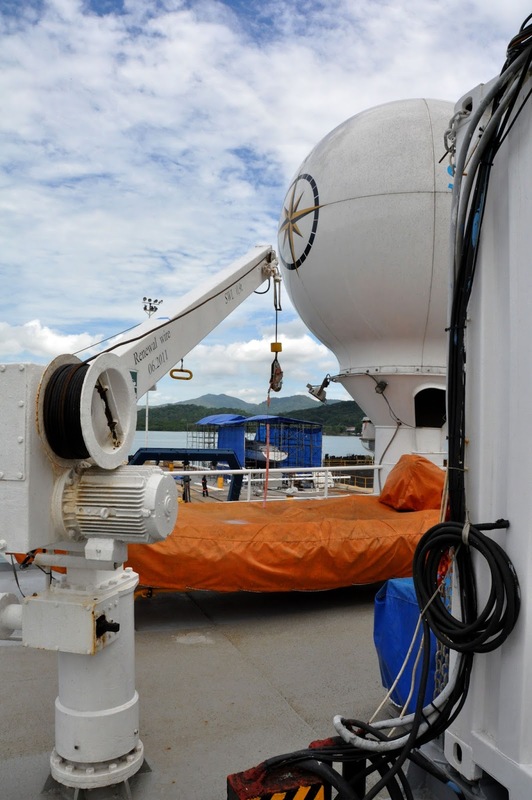 We toured the outside, Argus (the other ROV) covered in a blue tarp on the aft deck. Beverly pointed out features on each level, leading me up to the control van. When we stepped inside, the difference in temperature was a delight. The control van was dark and cool, a stark contrast to the tropical heat and glare outside. “And there is where you will sit,” Beverly indicated, pointing out my spot in the lineup of monitors and headsets. My stomach fluttered. We returned to the mess, where everyone was having lunch. “Are you hungry?” I was asked repeatedly; “You should eat.” I had eaten a late breakfast at the hotel, but truth be told, I was too excited to feel hungry quite yet. I pulled out the patches I had designed for the expedition and started introducing myself around and handing them out. I was pleased to be able to greet new people with a small gift. And I received gifts of my own, Nautilus polos, T shirts, hat, patch, and mug. Beverly had a Nautilus logo tag she had created on a 3D printer. Mind swirling, I settled in to my cabin, choosing a bottom bunk (we only have a skeleton crew during the transit to the Galapagos, so I get the cabin to myself for the next several days). 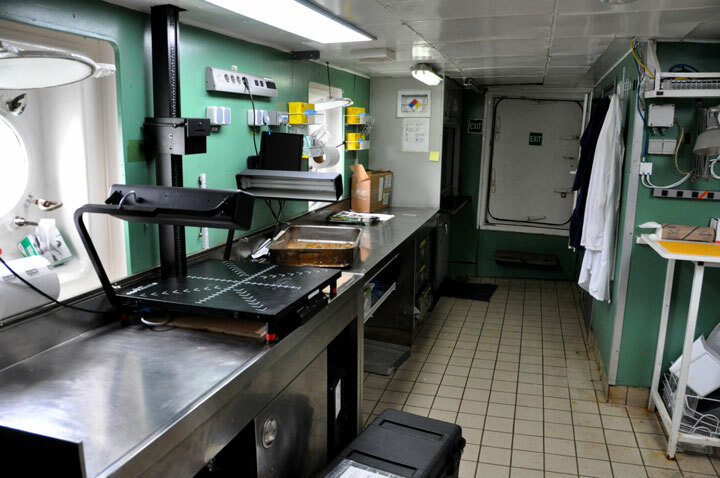 I then wandered around the ship, taking more photos, and committing locations to memory. Outside, the air is warm and muggy. 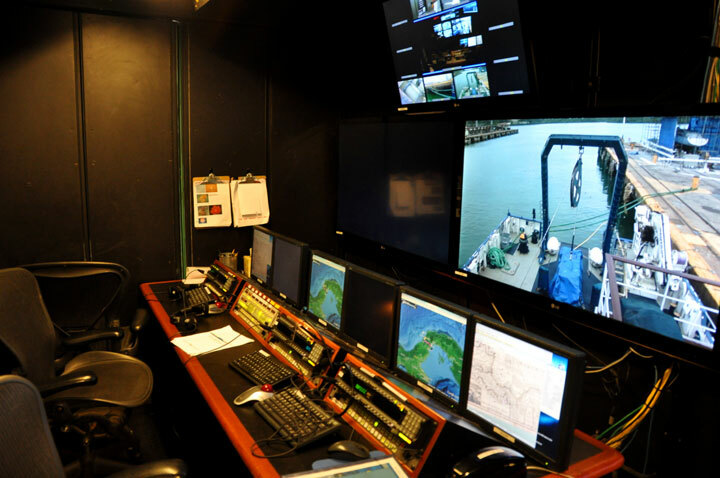 The large “ball” to the right contains communications equipment that allows the Nautilus to broadcast live to the world in real-time. Later on in the afternoon, a large group of us went back ashore for dinner in the city. As we left the shipyard, it started to rain. The drops were huge and fat, and visible as they fell. I scrambled to cover my camera with my T shirt. Nine of us crowded into two small cabs, me and Emil and Renny crammed into the back seat of a bright yellow Fiat. Suffice it to say we were well acquainted by the time we wound our way through the rush hour traffic to our destination. The mood at dinner was jovial, and before long my cheeks hurt from smiling and laughing. The service was excruciatingly slow, but it didn’t really matter. Another long cab ride back (this time in a much more spacious van), and then some time to call home and do some writing. The ship fell quiet as people wandered off to bed. “You don’t have any interactions for a couple of days,” Allison told me, “so you will have some time to settle in.” We were to refuel in the morning, then have the hull cleaned, a requirement to enter the waters near the Galapagos. It was hoped we would be on our way by about 3 pm. The wet lab, where specimens are processed. Finishing my blog posting, I shut down my computer and found my way down to my cabin. My legs ached from scrambling up and down the steep stairs all day, two flights of them down to my level. I took my first shower aboard the ship, climbed into bed, journaled about my day, and switched off the light. I hoped sleep would take me quickly, but it was elusive. My mind raced as I lay in the dark. It was warm in my room, and the noise of the engine running, running, running was still new enough to keep my brain turning. Thankfully, I already knew the next day was a light one, so I permitted myself to lay in the dark and think and slowly sink into sleep. One small disappointment: I had thought I would be on board for the transit of the canal, but the ship had completed that as I had slept in my hotel room the night before. But in the scheme of things, it was not important: tomorrow we would sail for the Galapagos! Awaiting Melissa’s E/V Nautilus Live watch!